Continuously learning systems (CLS) have shown great promise for improving product quality in the pharmaceutical and medical device industries. These artificial intelligence (AI) algorithms constantly and automatically update themselves as they recognize patterns and behaviors from real-world data, enabling companies to become predictive, rather than reactive, when it comes to quality assurance. However, the output for the same task can change as a CLS algorithm evolves. This stands in sharp contrast to systems traditionally used in the life sciences, which are validated and expected to not change — performing exactly the same way each time they are used. The team includes members from pharmaceutical, medical device, and computer technology companies, and from academia and FDA. 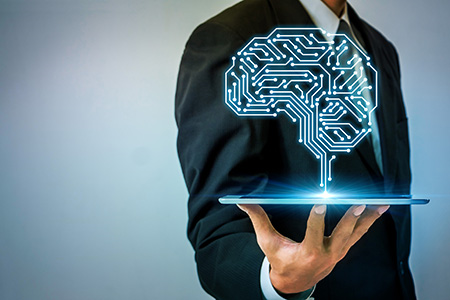 FDA involvement is critical in this effort, as both industry and regulatory agencies need to trust the science behind the AI and evolve their understanding of AI together. One of the two team leaders for the CLS Phase 1 effort has been FDA Center for Devices and Radiological Health (CDRH) Senior Biomedical Research Scientist Berkman Sahiner. Sahiner kicked off the CLS team presentation by providing some background on the team’s work, including opportunities and risks with AI systems, and questions the team endeavored to answer as it examined the use of systems that continuously learn. On the other hand, there are also some potential risks — for example, there might be unintended and undetected degradation of performance over time. This could be due to data quality, inadequate testing, or statistical variations. If I were a potential user in the medical field, what types of tests or design processes would provide me reasonable assurance to accept and use a CLS? How do we ensure that the updates due to continuous learning do not compromise the safety and effectiveness of the associated device? How do we control the quality of new data? How do users adapt to an evolving algorithm? When and under what conditions should an algorithm update occur? Can and should performance testing be conducted after each algorithm modification? What Is Unique About CLS? Sahiner’s co-leader for the Phase 1 CLS Team, Abbott Laboratories Quality Head for Informatics and Analytics Mohammed Wahab, explained that a primary goal of the team was to focus on what is unique about continuously learning systems. Philips Regulatory Head of Global Software Standards Pat Baird explained that the primary deliverable for the CLS team was a white paper covering best practices for a CLS and how they can be adapted into healthcare. Baird was a co-chair of the CLS medical device sub team from the Phase 1 work and one of the primary authors of the white paper. He is now serving as a co-leader of the entire Phase 2 CLS team. 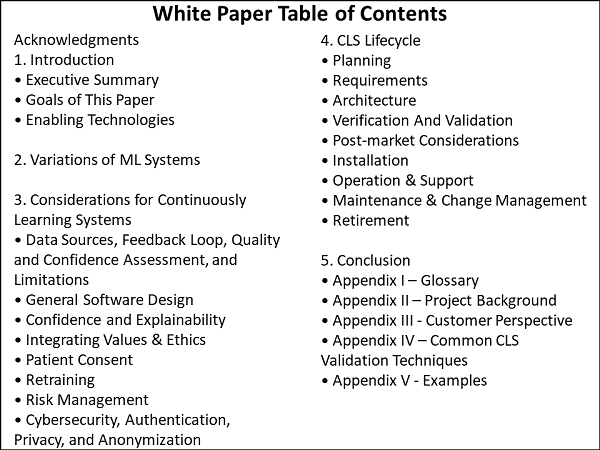 Baird explained that the white paper assumes the reader understands how to write software and requirements, so its focus is on aspects of CLS that differ from other systems. He presented a slide depicting the table of contents of the white paper (see below). He pointed out that the body of the paper is was intentionally kept concise and is only 18 pages long, with the remainder comprised of appendices. “Please take 20 minutes and read it,” he asked. One example would be information in public papers that gets updated, changed, or even rescinded. It is important to consider how those situations would be handled if the information was used in a CLS. Software version control is an issue for all manufacturers. However, Baird maintained, CLS systems could have multiple versions to track. As updates are pushed out, some will chose not to take the update, while others will update every time a new version is released. He also discussed the possibility of more continuous monitoring of the performance and questioned whether it would make sense to consider the concept of a continuous benefit/risk analysis that evaluates all the updates and the performance. Does AI Require Novel Regulatory Approaches? He pointed out that cGMP 820 for medical devices was last updated in 1996, and the first cGMPs date from 1976, when the Medical Device Regulation Act was passed. “So, we might need something different from regulation” to keep up with the rate of change and innovation in AI. Comparing the challenges of regulating AI systems to regulating a manufacturing plant, however, he found parallels that may indicate a vastly different approach is not needed. While data quality is important, it is not new. In manufacturing, the quality of the raw materials impact the quality of the finished product. That quality is controlled by supplier agreements and incoming inspection processes. In addition, while CLS performance changes over time and needs to be tracked, this is no different than checking product performance against a known standard. It is also synonymous with checking lab equipment against standards and recalibrating when needed. User bias and negative perception can cause a user not to trust the software. For example, a user that has had poor success with a previous version of a CLS may be highly skeptical of future releases, regardless of any objective evidence the developer may have about improvements to the product. There is additional pressure on CLS from evolving governmental requirements. One example is the EU General Data Protection Regulation (GDPR) that “defines strong legal stipulations about what the EU defines as transparency and the rights of individuals to ask for traceability in terms of how a particular decision or recommendation was achieved thorough software,” Wahab said. Vanderbilt University School of Medicine Anesthesiology, Surgery, Biomedical Informatics and Health Policy Professor Jesse Ehrenfeld — who is currently Secretary of the Board of Trustees of the American Medical Association — commented on what physicians and surgeons need in order to use, trust and rely upon AI outcomes. They want to be part of product development to ensure at the end that the application is “simple, usable and beautiful,” he said. The first example was a hospital study in which caregivers were shown fake lab results for fake patients on a tablet. There was a “general tendency” for caregivers over the age of 35 to be more likely to challenge the results and order another lab. Caregivers under the age of 35 were more likely to believe the lab results and proceed with the next steps. “There were questions about how much they were trusting it because it was on their tablet,” Baird said. In a second example, during California wildfires that took place earlier this year, the Los Angeles Police Department sent out a notice telling people to stop following their navigation apps. The apps indicated that there was no traffic in certain areas where the fire had spread, inadvertently directing people into danger. “This was probably something the people who developed the apps did not take into account in their initial software development,” Baird commented. The dialogue on the use of AI in what has been termed “the fourth industrial revolution” — a fusion of technologies that is blurring the lines between the physical, digital, and biological spheres — will continue at the FDA/Xavier PharmaLink Conference in March 2019. Participants will be exposed to some of the latest technological tools and shown how the tools are being used to rewrite how pharma manufacturing operations, quality systems, and supply chains are being designed and executed. Jerry Chapman is a GMP consultant with nearly 40 years of experience in the pharmaceutical industry. His experience includes numerous positions in development, manufacturing, and quality at the plant, site, and corporate levels. He designed and implemented a comprehensive “GMP Intelligence” process at Eli Lilly and again as a consultant at a top-five animal health firm. Chapman served as senior editor at International Pharmaceutical Quality (IPQ) for six years and now consults on GMP intelligence and quality knowledge management, and does freelance writing. You can contact him via email, visit his website, or connect with him on LinkedIn.